The Ellen Hutson Classroom August Mix It Up Challenge requires combining any Ellen Hutson Essentials and Clearly Besotted product. I have seen new stamps for Christmas as well as projects from crafters using the Holiday theme. However, I’m not ready to start my Christmas projects as yet. I’m just trying to savor the last bits of summer before the inevitable cold, gray weather sets in again! Unfortunately, I know fall isn’t too far away. School starts soon and it’s starting to get darker earlier in the evenings. So, I decided to celebrate autumn in this Ellen Hutson challenge. I love autumn, the crisp cooler (not cold) days and the vibrant colors I see all around. I love days in autumn when the sky is a bright, clear blue and the leaves are all vivid shades of red, gold and yellow. For this project, I used a mix of leaf images from the Essentials by Ellen Autumn Acorn and the Clearly Besotted Autumn Flowers stamp sets. I love the leaves from both of these sets. I think that the combination of a more graphic-designed leaf with traditional looking maple leaves makes for an interesting mix. I stamped a background montage of leaves in autumnal colors onto to a circle of white cardstock about 2.75 inches in diameter. I added a variety of different colored dots using one of the images from the Autumn Acorn set for added interest and to fill up blank areas in the background. I then used a stitched circle die to cut out an area on a vertical A2 card which I used to layer over my stamped background. The circle die was slightly smaller than background image circle. I cut down the width of the A2 to 4 inches and mounted that onto an A2-sized rust-colored piece of cardstock. 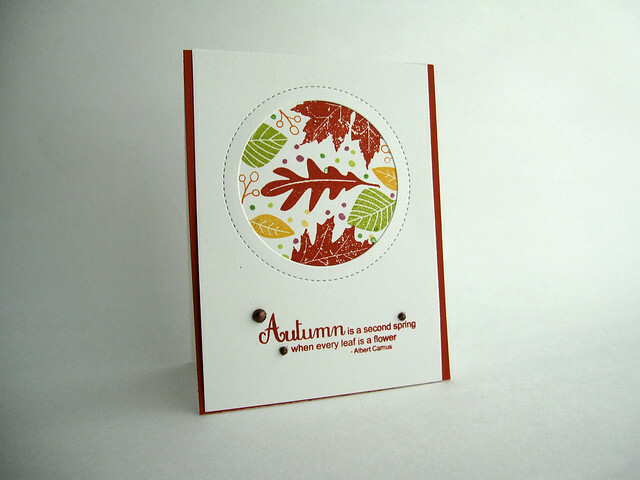 The card front was stamped with an the autumn quote from the Clearly Besotted stamp set and mounted onto a top-folding vertical-oriented card base of white cardstock. I add some coppery-brown colored glittered dome-shaped embellishments around the sentiment as a finishing touch. Stamps: Essentials by Ellen Autumn Acorns stamp set; Clearly Besotted’s Autumn Flowers stamp set. Cardstock: Neenah Solar White 80# for card front; Neenah Solar White 110# for card base; Papertrey Ink cardstock in Terracotta Tile. Inks: Papertrey Ink: Terracotta Time, Canyon Clay, New Leaf, Simply Chartreuse, Limeade Ice, Summer Sunrise, Orange Zest, Autumn Rose. Other: Glitter domes in coppery-brown from my stash. Simon Says Stamp’s Flickr challenge #25 is a tricky one. The challenge is to make a card using a white on white style. The guidelines are to use as little color as possible on your project. I discovered that to make a white on white card interesting, you need some kind of texture or dimension. So, I used an embossing folder to create raised stripes for the background of the front of the card. I die cut each of the flowers three times and glued them together to create a thicker flower for additional dimension. 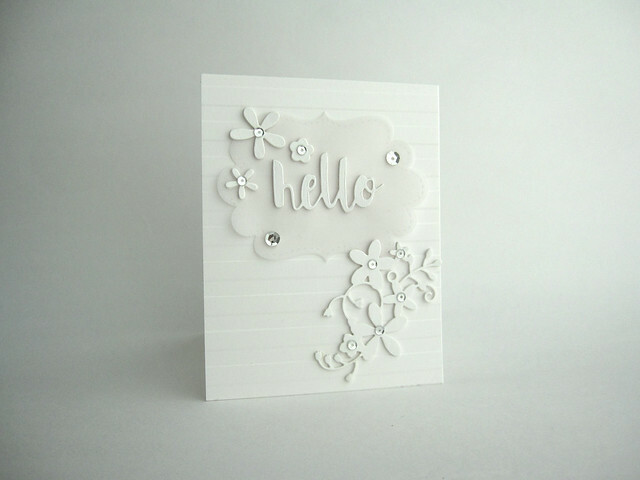 The hello sentiment was die-cut three times as well and glued together for the same reason. The stitched label was die-cut from 60# vellum and used as a base for the sentiment for additional textural interest. The flowers were all die-cut from linen textured cardstock, though the photograph does not pick up this detail as I would have liked. My only color is the addition of silver sequins which only adds to the tone-on-tone look. Dies: Simon Says Stamp: Hello (from Painted Words die set); Simon Says Stamp: Calliope Flourish die; Paper Smooches: Frame 1 die; Paper Smooches Wise Dies: Flowers 2. Cardstock: Neenah Solar White 80# for card front; Neenah Solar White 110# for card base; Linen-textured cardstock from my stash; Bazzill 40# vellum. Other: Lifestyle Crafts: Stripes embossing folder; Pretty Pink Posh: silver sequins.